Recommended supplies: walking foot, zipper foot, denim needle (size 90), Elmer's glue or glue stick, chopstick, wonder clips. Sewing machine in good working order that you are experienced using and comfortable operating is required for each class. Also bring all machine accessories, presser feet and manual. Fabrics, materials and pattern will vary every month. A supply list will be posted prior to each month's session. Visit Natalie's Sew Hungry Hippie site here! I'm Natalie, aka the Hungry Hippie. I wear flowers in my hair, obsess about recycling, and I am always eating cheese. I'm a former Army Nurse Corps Officer turned tree hugging, granola eating "hippie" as my 20 yr Vet Husband likes to call me. 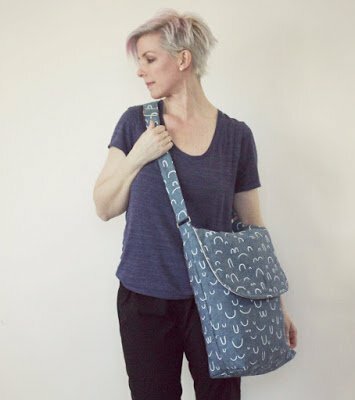 I create patterns for sewing and quilting projects that are modern and fresh, with the aim of helping everyone through - no matter your skill level. Sew Hungry Hippie is all about sewing projects for the adventurous beginner or intermediate sewer. Nothing too intense. No focus on absolute perfection. (Gross.) JUST CREATE.